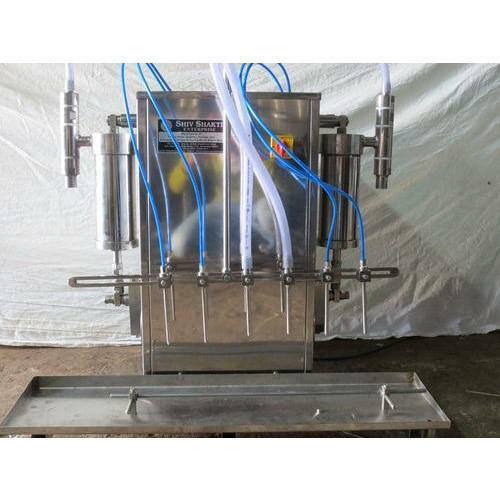 Edible Oil Filling Machine are offered as single head to multihead option based on production output requirement of the client. Variation in filling machine models allows a user to decide the accurate models to suit the most appropriate solution for oil packaging line. Model variation offers minimum waste and maximum output with the highest accuracy of filling volume in the industry. Located in the capital of engineering machinery, Ahmedabad (Gujarat, India) we “Shiv Shakti Enterprise” are actively committed towards Manufacturing, Exporting, Wholesaling, Retailing and Supplying highly efficient Mineral Water Filling Machine, Capping Machine and much more. Our offered machines are extensively demanded in well-tested pharmaceuticals, chemical, food processing, mineral water and many more industries for filling, capping and packaging purposes. Bottling machines provided by us are fabricated in accordance with global quality Stanwell-tested components and sophisticated technology under the supervision of our veteran engineers. Being a quality driven company, we assure our clients that these bottling machines are rigorously checked against numerous parameters by our quality controllers. Our offered machines are well known among our clients due to their rugged design, smooth functioning, excellent performance, high efficiency, low maintenance cost and long working life. After considering clients' different needs, we provide these machines in customized options at most affordable prices within the promised time frame.